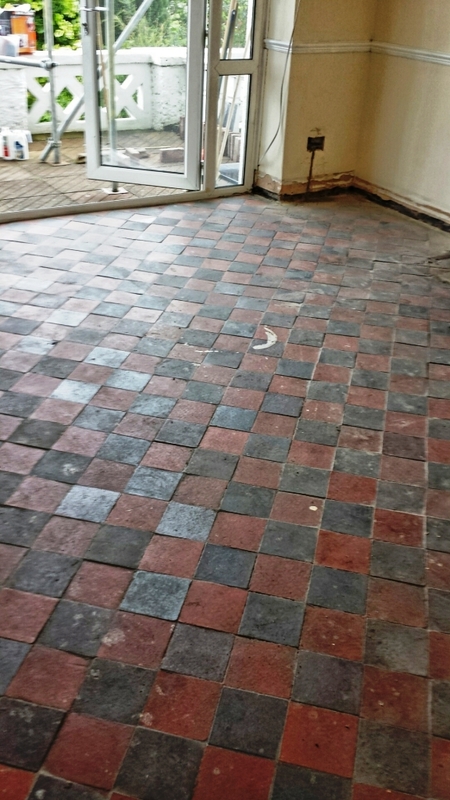 This Red Quarry Tiled floor had been laid when the house was built back in 1910 so it was over 100 years old and had years of wear and tear to show for it including old cement and paint from some decorating work that had been done some years prior. The house was located in the town of Treharris just outside of Cardiff and being an original feature of the house the owner wanted it looking as good as it could be. I first checked for any moisture as these old floors were often laid without damp proofing and a damp floor can impact sealing later. Fortunately the reading was nice and dry, I then set about carefully scrapping off as much old paint and cement as possible. I then swept up as much of the dust as I could and caught the rest with a hoover. The next step was to cover the whole floor in Tile Doctor Remove and Go mixed with a little NanoTech Ultra Clean which basically adds tiny abrasive particles to a powerful coatings remover. I left this on to soak into the tile for about an hour knowing that using this combination would not only remove any old surface coatings such as sealers it would also clean the floor as well. The solution was then worked into the floor using a rotating scrubbing brush attachment on a floor machine effectively letting the machinery do all the hard work. 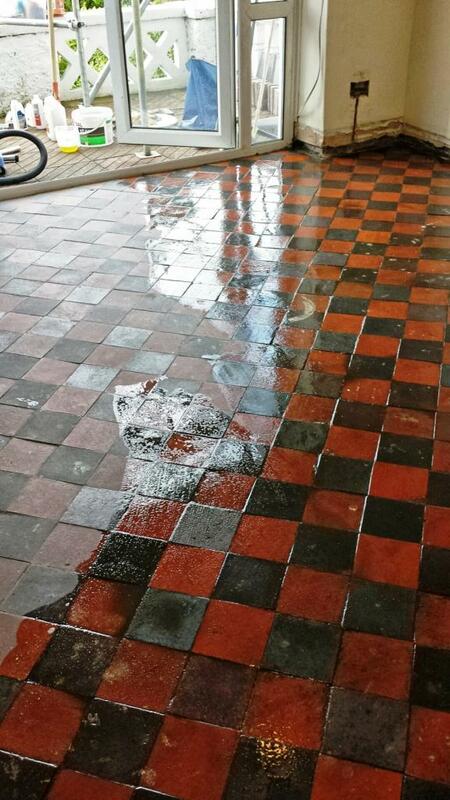 The floor was then rinsed twice with clean water which was then removed using a wet vacuum. It was clear at this point that the cement I could see on the surface of the tile was basically grout from an appalling tiling job when the floor was laid 100 years earlier. Fortunately Tile Doctor has a solution for that problem called Grout Remove and Go which is an acid based product that will remove grout and mineral deposits such as efflorescence. Being an acid I had to be careful so it was applied to the tile working one square metre at a time cleaning and scraping as I went along. After each section the floor was given a good rinsing again using the wet vacuum to remove the liquids from the floor. 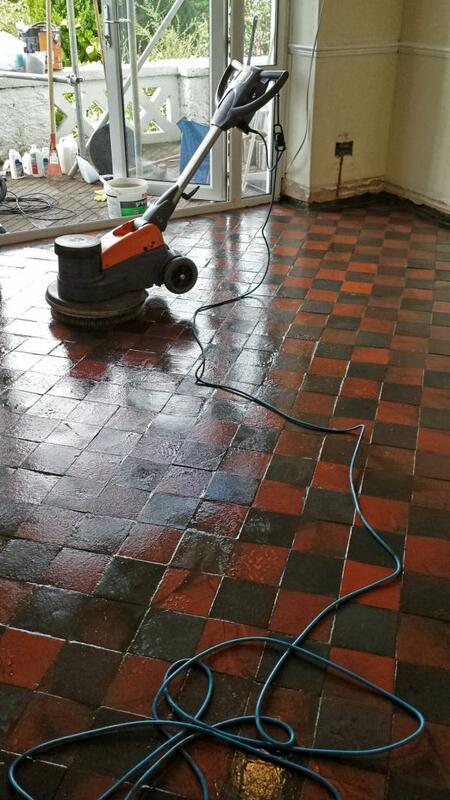 The last step of the cleaning process which I always do for Quarry and Victorian floor tiles was to finish off the rinsing process with a steam clean which brings out any remaining dirt and brings the tile back to its raw state. I cleaned the floor on the Friday and then left it to try for two days coming back on the Sunday to damp test the floor once again to ensure it was ready for sealing. 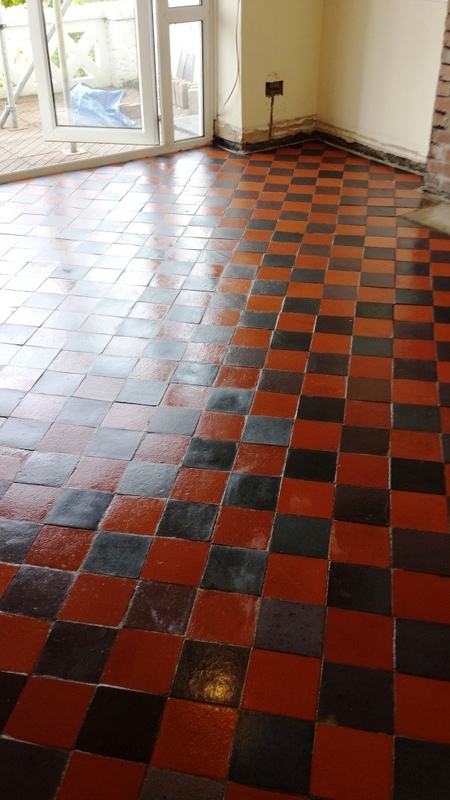 The moisture reading was fine for sealing and as the customer had asked for a mild shine finish I sealed the floor using Tile Doctor Seal and Go which brought out the black and red colours in the tile back to life.